Quite sadly, after a long period of illness, Rose M., the mother of my friend Bernice, passed on. Basically, she was homebound for longer than I have known Bernice. She suffered from illnesses that affected her heart and breathing. I did not know Rose well. Because of her numerous allergies, I never went into her home for fear that allergens from the cats and dogs in my home would trigger her asthma. So much of my knowledge of Rose came from her family and friends who had true relationships with her. Not too many people actually visited Rose because of her extreme allergies. She spent most her days at home using the telephone and texting as her primary method of socialization. The TV and the Internet were other ways she connected with the outside world. She also was a crafter who embellished ordinary items into creations of beauty. Her friends remember her as a good listener who gave good advice. She was witty, funny, and had a strong character. Monetarily, she was the opposite of rich, however, she was a person who always remembered people on their birthday and other important occasions by sending them thoughtful gifts. After her passing, I helped Bernice with the process of cleaning out her mother’s belongings. If you did not know a thing about Rose, you would have known her well from the things that were in her house. The house was filled with gifts and crafting materials. 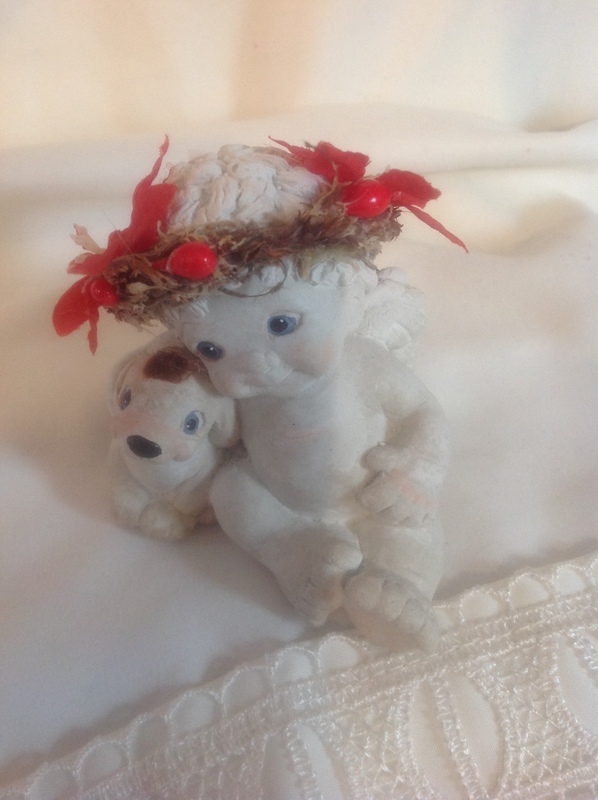 Additionally, she was a collector of angels, ceramic dogs, and jewelry. The amount of “stuff” in her house was somewhat out of control. It made me wonder not only about the psychology of collecting, but also that of gift giving. So, after a basic Internet search, some of my questions were answered. Why do people collect? According to Wikipedia, there are many reasons, some that have a dark side, others a happy side, and a few that are pathological like hoarding. Regardless of the motivation, people collect almost anything. The attraction to their collections is not monetary but emotional. People may be using their collection to relive childhood memories, connect to a part of history that intrigues them, or keep the past present. Collectors enjoy the thrill of the hunt and enjoy social camaraderie by sharing their collection with others. It becomes a lifelong quest, which is never quite complete. On the darker side, collecting could fill a void, ease anxiety over losing a part of themselves, provide emotional security, and possess objects of their desire, ownership and control. My other question, why do people give gifts, was answered by Tara Parker Pope, in a New York Times Article from December 11, 2007 “A Gift That Gives Right Back? The Giving Itself.” As researched and reported by Pope, gifting is a rather complex human interaction. Psychologically, the giver gains more from the action than the receiver of the gift. However, its importance resides in how it defines and strengthens relationships and bonds with family and friends. Gift giving shows the importance of relationships and is a way for us to show our feelings of care for a person. If you are on someone’s gift list, feel honored. The connection between collecting and gift giving lies in the effect it has on people’s emotions, it makes them feel good. Both satisfy the need for friendship and intimate relationships, collecting through camaraderie, gifting through the strengthening of relationships. Only when these basic human needs are unmet, they can be used to fill a void in our lives or as an attempt to manipulate people. As I remember Rose and the circumstances of her life, I can see how gifting was her way of trying to strengthen the ties and relationships with the people in her life. ; it made her feel good. Many people received gifts from her posthumously as they were purchased and marked for gifting well in advance of an occasion. As with most people, she was a complex person with competing needs and desires. Being homebound complicated the situation. With her strong love for family and friends and strong character, she will be remembered well into the future. The gifts and collections she left behind will trigger these memories as she probably intended them to. At her funeral, one of Bernice’s friends commented to me that “everything that Bernice is, is because of her mother”. Quite certainly, she acquired the very best characteristics of her mother. So in honoring Rose and the legacy she has passed on to her children and grandchildren, it is now time to let her rest in peace. We all share the need for friendship, belonging, and love. This goes beyond the inanimate objects that are sold by Linnice. However, knowing that in some way these objects of the past can be used to make someone feel good by remembering the past or by selecting a gift for someone special in their life makes it feel like something more than just an eBay store. Remembering that people are the center of any business, and meeting their needs is most important will keep me focused on trying to provide that service to our customers. ← Is it Knowledge, Luck, Reputation?